Print on paper that is heavy enough for the paint you are using. We used 32lb. paper for liquid paint. To use the exact paper that you prefer, draw the boxes on the paper. 2. Next paint one outer box the *complementary color. 3. Paint the other box the *split complementary. In the first example, red is in the inner squares. - Red's split complement, yellow-green is painted in the first outer square. - Red's complement, green, is painted in the second outer square. The other 3 examples are labeled. Compare the brightness of red when surrounded by it complement green and when red is surrounded by its split complement, yellow-green. Based on the samples from my images, which could be off, the color scheme is close to being a split complementary color scheme. Based on the color samples from images, the dark blue sky in the upper part of the paint is complementary, yet the lighter part of the sky, which is more prevalent in the painting, is closer to a split-complementary color scheme. Select 3 color combinations from the ones listed here and over the course of 3 days or more, mix paint colors based on your choices and paint the comparison boxes that you've either printed from this page or drawn. Pointillism - Experiment with this technique, not necessarily on an entire painting, but on small samples [6"x6" or smaller] for the purpose of learning the effects of placing dots of certain colors next to each other. 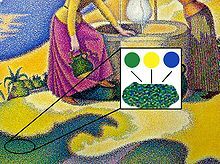 The preferred medium for pointillism is oils because it is less likely to run and bleed with adjacent dots.